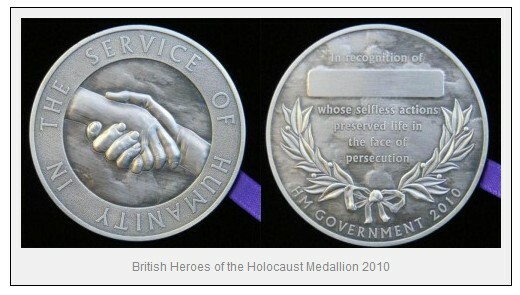 In March 2010 the first ever recognition of Britons who saved the lives of Jews and other persecuted groups during the Holocaust was bestowed by the Prime Minister. The awards are the first to recognise the acts of civilians who showed extraordinary acts of courage during the Holocaust in order to help their fellow man. "It is right that we reflect and learn from the past as we go forward in the future. That is why I was pleased to create a new award to recognise those amazing British individuals who through extraordinary and selfless acts of bravery protected and rescued Jews and others in the Holocaust. "These individuals are true British heroes and a source of national pride for all of us. They were shining beacons of hope in the midst of terrible evil because they were prepared to take a stand against prejudice, hatred and intolerance. We pay tribute to them for the inspiration they provide now and for future generations to come." It was posthumously awarded in 2010 to Bertha Bracey (1893-1989), a Quaker, who made a large contribution to the rescue of victims of Nazi oppression. The brief was the concept of ‘a universal celebration of exceptional British citizens who through their bravery and selfless actions, helped to save Jews and others in the Holocaust’. The obverse side shows clasped hands with a background of clouds. ‘The medal is designed on a background of clouds symbolising the ‘dark cloud’ that, in the words of Winston Churchill, gathered over Europe.’ The words ‘In the service of humanity’ are engraved round the edge. The reverse has the words ‘In recognition of …….. whose selfless actions preserved life in the face of persecution’ leaving space for the recipient’s name to be engraved. She came from Birmingham and was a teacher for five years. In 1921 she went to live with a family in Vienna and served in relief and reconstruction work at the Quaker Centre, and established a number of clubs for young people. She then went on to do further work in Nuremberg, setting up a depot for needy families where they could purchase food and clothing cheaply, later moving to Berlin working again with young people. In 1929 she came to London as the administrative secretary of the Germany and Holland Committee of Friends Service Council, putting into practice a vision of Quaker centres for reconciliation and peace. The nature of Quaker work changed when Hitler came to power in 1933 and Bertha Bracey became the secretary of the Germany Emergency Committee. She now commenced the most important part of her life, organising Quaker help for Jews persecuted by the Nazis in Germany, Austria and Czechoslovakia, and destitute Jewish refugees in Paris. This meant assisting Jews to flee these countries and finding work and accommodation for them in Britain. She spoke fluent German, had considerable experience of Germany and Austria and had a large network of useful contacts. She began with one part-time assistant and they had 18 cases under review but, by 1938, as the trickle of refugees became a flood, she had responsibility for 59 staff in Friends House and the nearby Drayton House; the staircases were filled with refugees. In 1939 it was decided that the mainly Jewish refugee organisations could operate more effectively under one roof in Bloomsbury House and Friends Committee for Refugees and Aliens moved into 25 rooms there with 80 staff and 14,000 case files. In the early days of Hitler’s regime Bertha Bracey was one of a few British Friends who were able to exert pressure through eminent people in church and state both in Britain and Germany in order to secure the release of individuals in political custody. But she also succeeded in saving whole groups of children. In 1934 she had administrative responsibility for establishing a Quaker school in Holland for 100 German Jewish children and provided employment for German Jewish and Quaker teachers. One incident, which gave her particular satisfaction, was the part she was able to play in the rescue of 10,000 German Jewish children: the Kindertransport. Shortly after the Kristallnacht, a leading Nuremberg Jew found that Jewish parents were desperate to get their children to safety. Since it was too dangerous for British Jews to go to Germany, six Quakers were sent out to report on the situation. On 21 November Bertha Bracey joined a delegation to the Home Secretary, Sir Samuel Hoare, and that same evening Hoare obtained the consent of Parliament to the admission of the children. The first group arrived on 2 December. Another striking example of Bertha Bracey’s concern for children came in 1945 just before the end of the war and in the wake of the American advance. Three hundred orphans were found alive in the Theresienstadt concentration camp in Czechoslovakia and with the assistance of RAF Bomber Command she had them flown to a reception camp by Lake Windermere. When war broke out in 1939 Friends became concerned about the 60,000 Jewish refugees in Britain who were now unable to proceed to countries abroad where they were to be settled. Some were destitute, some were classified as enemy aliens and confined, all were in need of support and care. Bloomsbury House set up training schemes that would help refugees qualify for jobs often very menial. By the end of the war 95% of refugees were self-supporting. In 1942 Bertha Bracey received the OBE for her work for refugees. In 1946 she was appointed by the Allied Control Commission in Germany to handle refugee affairs, and was later put in charge of women’s affairs in the British and American Zones, and there she remained until she retired in 1953 at the age of 60. In a talk about Bertha Bracey given in 1992, a leading Friend suggested that the saga of the relief effort in this century, and the help given to German Jewish refugees, is as important for Quakers as the struggle for penal reform or the fight against slavery, and that in the help given by Quakers in the 1920s to the 1950s Bertha Bracey played an especially significant role. Yet I have to confess that until I saw her obituary in The Friend I had never heard of her and this remains true for many Quakers today. I was very moved by her life and the way it expressed the concerns and ideals of the Society of Friends. I also noted the obituary in the Jewish Chronicle, which in its tribute spoke of her as “a righteous gentile instrumental in saving thousands of Jews from the clutches of the Nazis.” In February 1998 I went with a party from Wimbledon Synagogue to Beth Shalom (the House of Peace), a remarkable and very moving Holocaust museum in Nottinghamshire. It was set up by a Christian family, who felt there was very little concern about the Holocaust in non-Jewish circles in Britain and that Christians needed to be reminded about their involvement in centuries of anti-Semitism and of their terrible failings during the Holocaust. It is visited by thousands. They have a lovely white rose garden where individuals, families and groups have dedicated roses in memory of those who perished. I could not see any roses dedicated by Christians and thought it would be important to dedicate a rose in honour of Bertha Bracey. A year later 30 Quakers from Wimbledon and nearby Meetings planted a rose in her memory at Beth Shalom. I think these words are still very apt today.